Ontech Systems provides efficient, reliable IT support services to Germantown based businesses as well as the Greater Milwaukee area. Over the past 10 years, our client retention rate has been 98% – one of the highest in the IT industry. Our commitment to superior service and customer satisfaction is why Germantown businesses have trusted Ontech with their comprehensive technical solutions for nearly a decade. Whether you need us to act as your complete, outsourced IT department or work in tandem with your existing in-house IT staff, our flexible approach to IT support will fit your technology needs. Ongoing Technology & Network Support: We provide remote or on-site support, troubleshooting, maintenance or application development. Installation of New Solutions: Installation of software, network hardware or other network solutions. It’s our business to know your network inside and out. Our wide range of technical solutions will bring productivity up and drive your costs down. From time to time, our customers will share stories about inept IT support from other providers that didn’t get the job done, took too long or where they failed to properly communicate with the client throughout the process. Some technicians will talk over your head and use technical jargon. 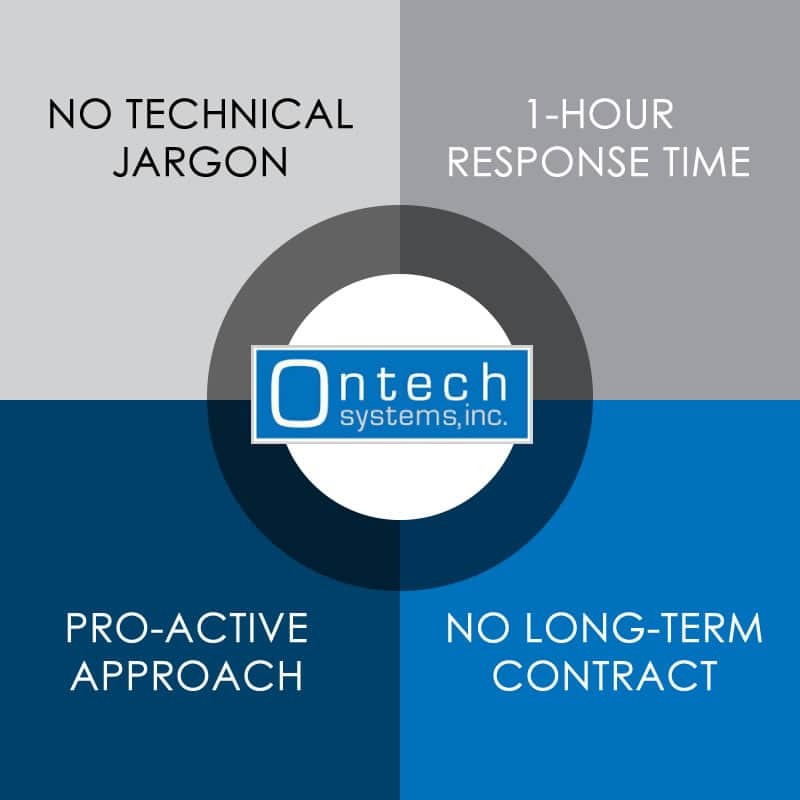 With Ontech, you can count on us to speak your language and work efficiently to get you up and running as quickly as possible. IT Support for Germantown Businesses – What Sets Ontech Apart from other IT Consultants? Our technicians use clear language, not jargon. No matter what your level of IT knowledge, we communicate with you in a way that makes you comfortable with what we are doing and why we are doing it so you stay informed every step of the way. We’re responsive. When your network is down, you run the risk of losing business. With our 1-hour response policy, during regular business hours, we will respond by phone or email within 1 hour of your request – not days or weeks later. We offer a pro-active approach. Our technicians work with you to integrate your overall goals and long-term growth potential into our IT support plan. We don’t lock you into a long-term contract. Our 98% retention rate over the last 10 years and dedication to customer satisfaction is why Ontech clients often see us as an extension of their business. Call us today to schedule your free, no-obligation Network Discovery. During this assessment, we will evaluate your existing network, identify any vulnerabilities and offer ideas to improve the productivity and efficiency of staff members. Our technician will audit your network and equipment, and explain their findings to you in an easy-to-understand question and answer session. We’ll cover important areas of your network like backup and data recovery options, confidentiality of records, virus susceptibility, eliminating SPAM emails and ensuring your hardware is reliable and up-to-date. Call Ontech Systems at (262) 522-8560 or contact us by email and have peace of mind knowing a reliable, responsive IT support team is available to support your current needs, growth and future objectives.